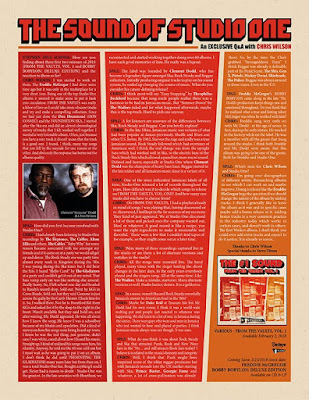 Discussions Magazine Music Blog: The Sound Of STUDIO ONE: An EXCLUSIVE Q&A with Chris Wilson! 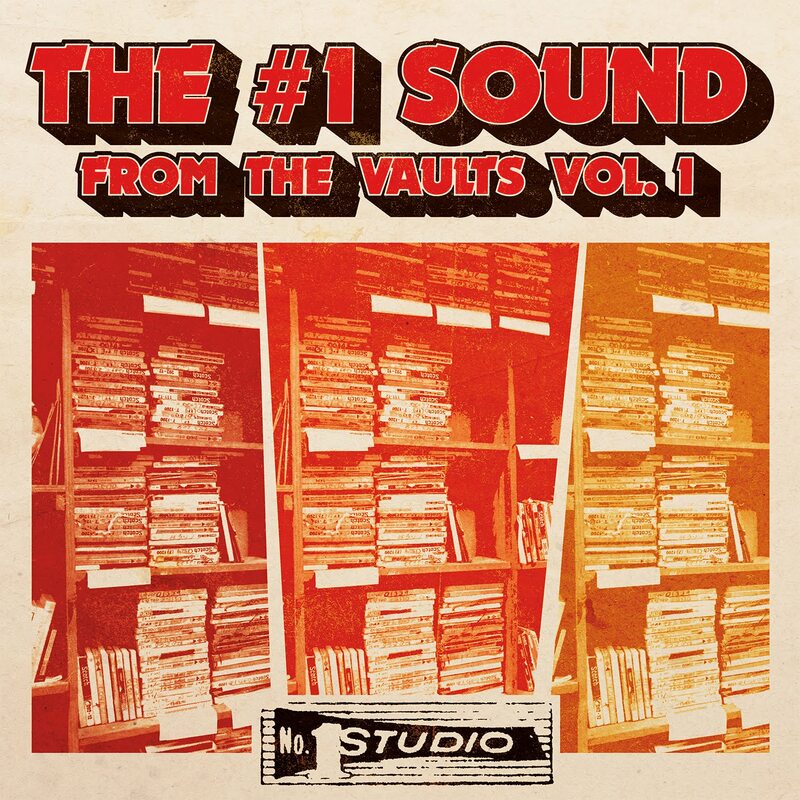 According to Wikipedia, “Studio One is one of Jamaica's most renowned record labels and recording studios, having been described as the Motown of Jamaica. The record label was involved with most of the major music movements in Jamaica during the 1960s and 1970s including Ska, Rock Steady, Reggae, Dub and Dancehall.” The label was founded by Clement ‘Coxsone’ Dodd and has become one of the most influential labels of our generation. Chris Wilson is the curator of the label’s vast catalog and is responsible for a plethora of reissues currently distributed by Redeye. STEPHEN SPAZ SCHNEE: How are you feeling about these first two Studio One reissue of 2018 - FROM THE VAULTS VOL. 1 and Freddie McGregor’s BOBBY BOBYLON - and the reaction to them so far? CHRIS WILSON: I was excited to work on them. The Freddie I had done some time ago but it was only in the marketplace for a very short time. Being one of the top Studio One albums it seemed to make sense to put it back into circulation. FROM THE VAULTS was really a labor of love as I could take more obscure tracks and try and make a compelling collection. Since we had just done the Don Drummond (DON COSMIC) and FOUNDATION SKA, I started after the Ska era and did an almost chronological survey of tracks that I felt worked well together. I wanted a very listenable album. Often, just because you have a rare track it doesn’t mean that the track is a good one. I found, I think, many top songs that just fell by the wayside for one reason or the other. And obviously the response has borne out the albums quality. SPAZ: How did you first become involved with Studio One? CHRIS: I had already been listening to Studio One recordings by The Heptones, The Cables, Alton Ellis and others. The Cables’ “Baby Why” for some reason became associated with me amongst my friends and if it came on at a party we would all get up and dance. The Rock Steady era was party time almost every week in Kingston during the ‘60s. I was young during the Ska times but I did hear the hits. I heard “Hello Carol” by The Gladiators at a party and couldn’t get it out of my mind. That bass vamp early on was like nothing else around. Really heavy. So, I left school one day and headed to Randy’s record shop. Sold out. Went by KG’s in Cross Roads. Sold out but they said Coxsone is just across the gully by the Carib Theater. Check him for it. So, I walked there. Not far to Brentford Rd. from KG’s and asked for it by the shop to the right in the front. Wasn’t available but they said hold on, and after waiting, Mr. Dodd appeared. He was all about how I knew the song. He knew I was a schoolboy because of my khakis and epaulettes. Did a kind of survey on how his songs were being heard up-town. I knew he was the real thing, just genuine, didn’t care I was white, cared about how I heard his music. Straight up. I kind of realized his songs were him, his identity. Anyway, he told me the 45 was sold out but I must wait as he was going to put it on an album. I don’t think he did until PRESENTING THE GLADIATORS many years later but from then on, I was a total Studio One fan. Bought anything I could get. Never had a reason to doubt - Studio One was the greatest. 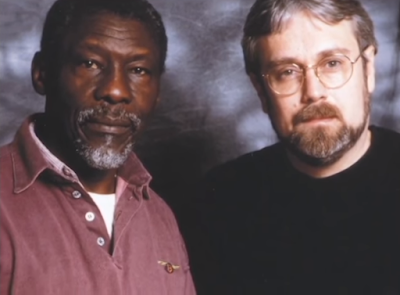 In the late seventies with Heartbeat, we reconnected and started working together doing over 60 albums. I have such good memories of him. He really was a legend. SPAZ: The label was founded by Clement Dodd, who has become a legendary figure amongst Ska, Rock Steady and Reggae collectors. Initially producing original tracks to play on his sound system, he ended up changing the course of music. What do you consider his career-defining release? CHRIS: I think most will say “Easy Snapping” by Theophilus Beckford because that song made people realize there was a business to be had in Jamaican music. But “Simmer Down” by The Wailers ruled and for what happened afterwards, maybe this is the top track. Hard to pick one anyway. 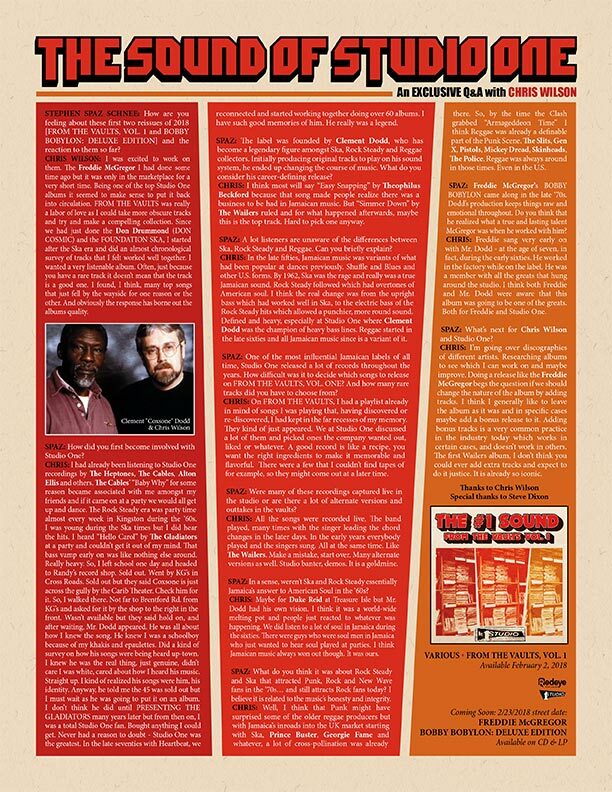 SPAZ: A lot listeners are unaware of the differences between Ska, Rock Steady and Reggae. Can you briefly explain? CHRIS: In the late fifties, Jamaican music was variants of what had been popular at dances previously. Shuffle and Blues and other U.S. forms. By 1962, Ska was the rage and really was a true Jamaican sound. Rock Steady followed which had overtones of American soul. I think the real change was from the upright bass which had worked well in Ska, to the electric bass of the Rock Steady hits which allowed a punchier, more round sound. 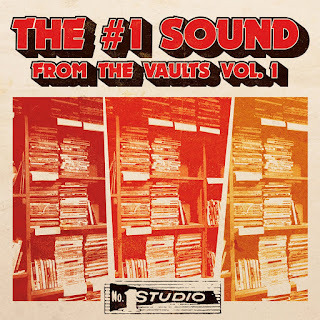 Defined and heavy, especially at Studio One where Clement Dodd was the champion of heavy bass lines. Reggae started in the late sixties and all Jamaican music since is a variant of it. SPAZ: One of the most influential Jamaican labels of all time, Studio One released a lot of records throughout the years. How difficult was it to decide which songs to release on FROM THE VAULTS, VOL. ONE? And how many rare tracks did you have to choose from? CHRIS: On FROM THE VAULTS, I had a playlist already in mind of songs I was playing that, having discovered or re-discovered, I had kept in the far recesses of my memory. They kind of just appeared. We at Studio One discussed a lot of them and picked ones the company wanted out, liked or whatever. A good record is like a recipe, you want the right ingredients to make it memorable and flavorful. There were a few that I couldn’t find tapes of for example, so they might come out at a later time. SPAZ: Did it surprise you that many of these great tracks never made it to CD before? For example, Bop & The Beltones’ “Love” and The Officials’ haunting “Ten Years Ago” (amongst many others) are true gems that should be on everyone’s Ska/Rock Steady playlist. CHRIS: No. Because that was always Studio One for me. The pleasure of discovery. Mr. Dodd did a lot of recording, unlike other producers, so there are still unreleased songs to find as well as all the forgotten releases. SPAZ: Were many of these recordings captured live in the studio or are there a lot of alternate versions and outtakes in the vaults? CHRIS: All the songs were recorded live. The band played, many times with the singer leading the chord changes in the later days. In the early years everybody played and the singers sung. All at the same time. Like The Wailers. Make a mistake, start over. Many alternate versions as well. Studio banter, demos. It is a goldmine. SPAZ: In a sense, weren’t Ska and Rock Steady essentially Jamaica’s answer to American Soul in the ‘60s? CHRIS: Maybe for Duke Reid at Treasure Isle but Mr. Dodd had his own vision. I think it was a world-wide melting pot and people just reacted to whatever was happening. We did listen to a lot of soul in Jamaica during the sixties. There were guys who were soul men in Jamaica who just wanted to hear soul played at parties. I think Jamaican music always won out though. It was ours. SPAZ: What do you think it was about Rock Steady and Ska that attracted Punk, Rock and New Wave fans in the ‘70s… and still attracts Rock fans today? I believe it is related to the music’s honesty and integrity. CHRIS: Well, I think that Punk might have surprised some of the older reggae producers but with Jamaica’s inroads into the UK market starting with Ska, Prince Buster, Georgie Fame and whatever, a lot of cross-pollination was already there. So, by the time the Clash grabbed “Armageddeon Time” I think Reggae was already a definable part of the Punk Scene. The Slits, Gen X, Pistols, Mickey Dread, Skinheads, The Police. Reggae was always around in those times. 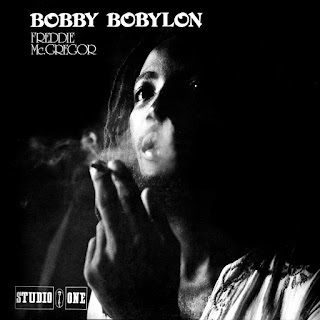 Even in the U.S.
SPAZ: Freddie McGregor’s BOBBY BOBYLON came along in the late ‘70s. Dodd’s production keeps things raw and emotional throughout. Do you think that he realized what a true and lasting talent McGregor was when he worked with him? CHRIS: Freddie sang very early on with Mr. Dodd - at the age of seven, in fact, during the early sixties. He worked in the factory while on the label. He was a member with all the greats that hung around the studio. I think both Freddie and Mr. Dodd were aware that this album was going to be one of the greats. Both for Freddie and Studio One. SPAZ: The bonus tracks on BOBBY BABYLON are wonderful additions to a flawless album. Were there more tracks to choose from that we’ll see on later releases? CHRIS: Freddie McGregor released three albums with Studio One which is a lot of material. There might be enough for a further release but not sure. A few recordings have not been collected - like his first recording - so maybe it’s time for a survey of his releases. SPAZ: What’s next for Chris Wilson and Studio One? CHRIS: I’m going over discographies of different artists. Researching albums to see which I can work on and maybe improve. Doing a release like the Freddie McGregor begs the question if we should change the nature of the album by adding tracks. I think I generally like to leave the album as it was and in specific cases maybe add a bonus release to it. Adding bonus tracks is a very common practice in the industry today which works in certain cases, and doesn’t work in others. The first Wailers album, I don’t think you could ever add extra tracks and expect to do it justice. It is already so iconic. SPAZ: What are you currently spinning on your CD or record player? CHRIS: I always listen to a lot of Studio One, obviously. Rarely other Reggae but I just started listening again to the Heartbeat Abyssinians’ album. I’ve been listening to July, a UK psych band. Always play the Pye-era Kinks. Was listening to The Beatles’ SGT PEPPER release that recently came out. Well, I guess it’s obvious I like old stuff. Often, I just pull something out like Fairport Convention, Big Star, Gene Clark. These all recent listens. Country Joe and the Fish’s ELECTRIC MUSIC. As of late, I've also been listening to The Staves and Tash Sultana.